Background: I have about 12-16 short boxes, not enough to be a major collector, but enough to require some strategizing about how to stack them. Right now, they are stacked 3 high and they juuust fit in a corner of the living room, which is the best room I have available right now for storage. I have back issues that make me mindful about avoiding moving these around too much, but I want to be able to enjoy my collection. Goals: I'm looking for something not too fancy/expensive, but also not too ugly to go in a living room - nerdy is fine, but not too trashy. I'd love it if it had pull out shelves, and of course, it has to be able to actually hold the weight of comics. I found some nice pull out shelves at IKEA, but they're designed for stacked shirts and I have ... doubts. Any ideas? What compromises have you worked out in your own house? I am interested in hearing any and all replies and suggestions coming your way, being in the same boat. I have about 25 short boxes and for now, what I did was stacked them in a corner. 3 diagonal, with 2 horizontal in front of those. Then criss-crossed the pattern going up to 5 high. The stacking has gotten big, and am in need of a solution. However, I do know of the storage houses that may be of some use. If you're handy, get out a hammer, some nails (or drill and screws) and build some shelves! Here's some pics of my comic cave when my son and I (the "Scott" mentioned in the pictures) had just built and put in the first couple of sets of shelves shortly after I moved into my new house (since then, we've put up another set on the other side of the room), so you can get an idea of the thickness of wood needed and what a good set of home built short box/book shelves look like. . . These are pretty old pics I put up on FB to brag on my son's paint skills and show off my new comic cave to a friend, but you get the idea. And yeah. . .those short boxes ARE pretty waterlogged. They went through a hurricane in Florida where my house flooded out. Luckily everything was bagged and the comics came out fine. Most of the boxes are replaced now. . .and there's also 45 of them at this point. Gonna need more shelves soon. Background: I have about 12-16 short boxes, not enough to be a major collector, but enough to require some strategizing about how to stack them. 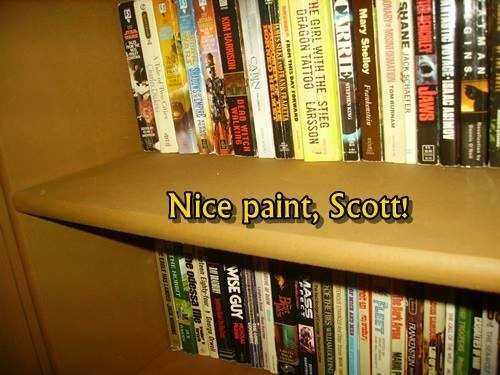 First off hey that's nothing to scoff at that's a good collection. I currently have an assortment of boxes, no fixed dimensions which makes it difficult to accommodate. However this weekend I am planning on going to my local comic shop and selling/trading some of my collection and finally biting the bullet and buying long boxes (also had a hard time justifying buying cardboard boxes but uniform and purpose built is very intriguing to me now). 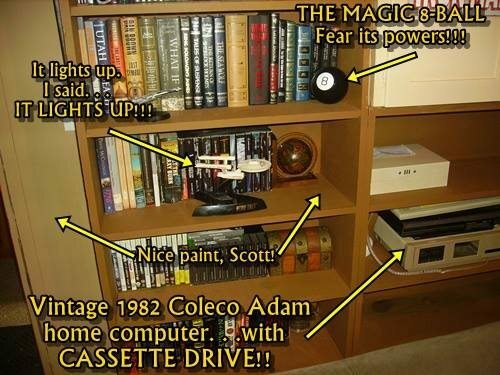 I am going to turn my spare bedroom closet into an organization station for my comic collection, maybe music collection and for my old tube tv (I won't get rid of it cause the old NES games work great on it especially with the zapper gun). Anyways it maybe a few weeks by the time I am done but I want to say that 'atom's photos of their set up looks well done. I do woodworking as a hobby and carpentry/contracting for a job currently and the fit and finish from the pics looks pretty decent. Good Job Atom and Scott. (also I hope my vernacular of saying pretty decent isn't taken negatively, I mean that in a good way from what I can see ) I think if you are capable of custom building that is the way to go. I have been tempted by Ikea before but I have also been disappointed by Ikea before. Also the satisfaction of building your own unit is rewarding as well (and a great bonding experience if built with family as atom did with their son Scott). Anyways maybe if I get it done in a timely (no relation to the comic company) manner I will try to upload photos. Also meant to mention (definitely not as a critique to atom, but also from the photos those shelves look thick enough to handle quite a bit) if you put a piece across the back the same length of the shelf and even up the sides that helps with strength quite a lot but that's more for non-adjustable shelves. I normally put a 1 or 2 inch piece on flat (normally the thickness of whatever I am working with whether it be 1/2 or 3/4) depending on the function. 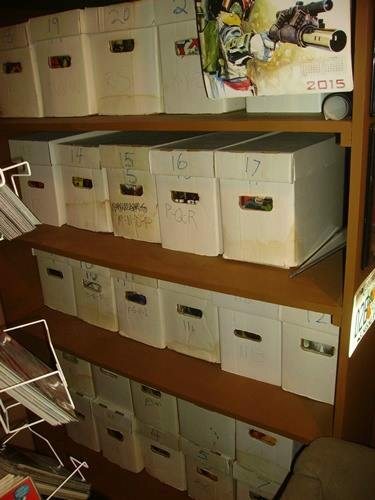 For comics we all know the weight adds up quite quickly and this helps with the shelves from sagging over time. 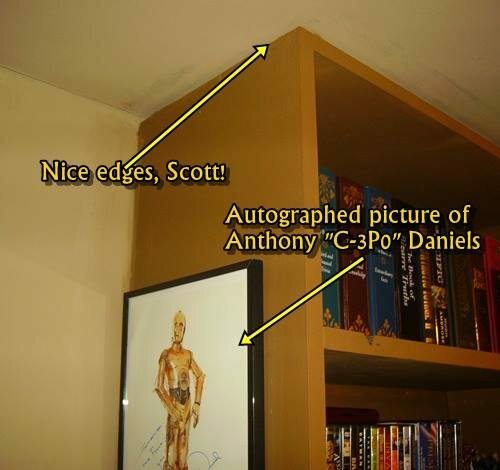 Also I normally use MDF or plywood for shelf units. MDF is good for painting but the "end grain" will absorb quite a bit. Plywood can be painted or stained and if you wish to hide the ply end grain it could be capped with solid material. Hint with painting MDF I normally do the first coat in a light colour of old or garbage paint. I normally always do a light sand in between coats so using the old or garbage paint (lots of times I get it from a local eco center as it is free) is acting as just a primer. Often the end grain of MDF I will do 2 or 3 coats of that paint before switching to my final chosen colour. I find this helps cut cost quite a bit because depending on the size of the project you can get away with buying just a quart instead of a gallon. Also it is a bit more environmentally friendly and even sometimes if you are not too picky about colour you may even find a colour at the eco center that works for you. I don't have the patience to build shelving, but would definitely like to have some for display. This lateral file cabinet holds (10) short boxes right now, there is also a slide out shelf in the middle. There are lots of different ideas in the land of Pinterest you may want to check out. For years I have used heavy plastic racks available from most hardware stores. I use the 5 shelf unit. They hold 3 long boxes or 6 short boxes per shelf, although I only put 3 short boxes on top shelf. I needed the units for my 22,000 comics and magazines. Currently I am redoing most of remaining 16,000 books into mostly short boxes, mainly to make them easier to move and access for regional Cons. Just not sure how they would look in the living room. Mine are currently in 2 bedrooms and a hallway upstairs, which is empty-nested. I couldn't find exactly what I've used, but this is pretty close. One unit would fit your short boxes relatively well (they might stick out a bit). What I've done though is bought two of them and cut a very thin piece of plywood to bind them together on each level, that way you can slide the boxes on and off without getting caught on the uneven parts. That fits a long box perfectly length wise, and four longboxes per level width wise. Seems a lot of us are in the same position. As Brody said in Jaws, "We're going to need a bigger boat." I myself have about 80 short boxes, 30 long boxes, 15 magazine boxes, and lots of loose stuff. My comic book room is a converted bedroom at the back of the house, right behind our future gameroom. I am in the process of cataloging, boarding and bagging my collection. Everything I don't want to collect anymore goes into my sell pile or the $1 bin. If it does not fit in these categories, I have a pile going of giveaways. My ultimate goal is to move from boxes to magazine holders, which would hold about 20 to 30 comics, but sit on a shelf. Here is a pic of what it would look like. Magazine boxes could be quite costly, depending on the size of your collection. Especially if it gets over 1,000 books. Here is a pic of one of about 14 shelving units. That's true. It will all depend on what I decide to keep. If there are too many, I will go with a sturdy shelf to hold short boxes. I am already labeling the boxes so I kind of know what is in them at a glance. DCSH1 is the box I am working on now. Contains DC Superheroes (namely Flash and Green Lantern). Either way, I plan to decorate the boxes (or lids) with the Comic Banner of the main comics inside the box. Nice shelving units, although they look like they are bending at the top a little. These units snap together and apart. Usually I stored the long boxes on bottom 2-3 shelves. These might have been switched out. Or it could possibly be the angle of the picture. Always small boxes on top shelf. Do you have the make and model number? I would like to get some like that.